The brand new Gibson 2017 Gary Clark Jr. Signature SG guitar captures the spirit of creative inspiration. 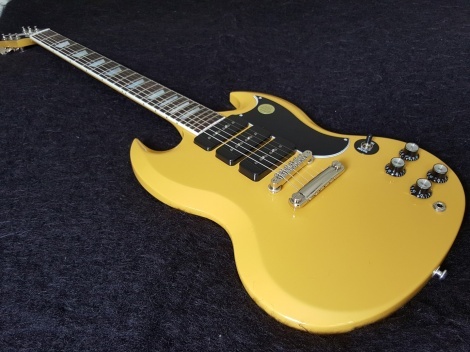 Finished in an exciting, vibrant Gloss Yellow and featuring a trio of aggressive Gibson P90 pickups, this guitar embodies the organic and sonorous sounds of one of this generation's most influential guitarists, vocalists and songwriters. Gary Clark Jr is a great Blues player and this latest offering from Gibson USA certainly looks like the perfect guitar for him. Loaded with three single coil P90 pickups - P90SR neck pickup, P-90SM middle pickup, P90ST and with an aluminium stop tailpiece with a traditional ABR bridge, this SG looks simple enough to use. With three Volume knobs and only one Tone control, you'll have to get used to that extra P90 pickup, if you have come from a more traditional twin pickup design SG, but it will give you some awesome tonal options. It is a slim taper neck design and the traditional 24.75-inch scale length and so should feel like a regular SG neck profile, as they tend to have slimmer '60s neck profiles. Also, it has 24 frets rather than the more traditional 22 of a Standard SG. This guitar arrived from Gibson USA with a finishing check in the nitrocellulose finish which has been repaired and is now only minutely visible, priced accordingly.